Neuse Tile is all about customer satisfaction, and we’ve often laughingly said, “we’ll install tile upside down and backwards” if that’s what the customer wants,” but, with this story, we’ll have to modify that when it comes to glass tile. An out-of-state relative hired a local contractor to renovate their master bathroom. They went to their home show, interviewed prospective contractors, reviewed their references, and selected one that gave them great confidence. We went up to visit, gave them some tips on selecting the tile and some things to look for as the process moved along. The first text message asking about the adhesive being used in the shower was a little concerning, but not all that unusual. We gave some online references and told him to hold firm with his general contractor that he expected the tile subcontractor to adhere to industry standards. However, the text which said “we were awakened at 2 a.m. by the sound of falling tiles” was startling. When we got on the phone and he began to describe the issues with his glass accent liner, we realized the tile setter who had been subcontracted to do the work had installed the glass backwards. Sometimes glass tiles are what we call ‘paper-faced’ meaning the factory rolls an adhesive paper over the front of the tile sheets (usually mosaics) before boxing and shipping. This keeps the individual pieces aligned (for the most part). 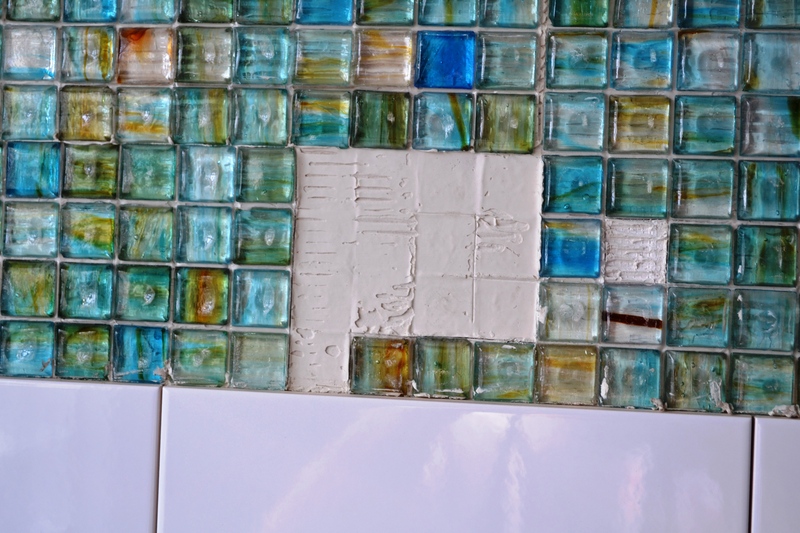 The intent is for the exposed glass tiles (which sometimes have small holes in them to absorb some of the setting material) to be laid into the troweled mortar and then the adhesive paper peeled off before grouting. However, this tile guy had laid the paper-side of the sheet into the mortar and gone home for the day. As the mortar dried and the tiles broke free from the adhesive paper, the small glass mosaics dropped off one-by-one. Thus, glass tiles hitting a newly tiled shower floor at 2 a.m. This was the last straw for our relative, and he insisted the contractor hire a different tile installer and re-do the job. When the new – and more qualified- tile installer came, he determined that the whole shower had to come out and be started over. The accent tiles were obviously an issue, but the shower pan had been sloped by doubling up sheets of backerboard- clearly not an industry-approved method! After 9 weeks, our relatives now have a great, new master bath and further appreciation for all the technical know-how that goes into our everyday work. And, we’ve contacted our national association to see if they can do something about getting more certified tile contractors in that part of his state. In the Triangle area, you are fortunate to have some well-qualified tile contractors to choose from. Know what’s under your tile – hire a professional and make sure your tile is installed right side out! Categories: Glass Tile and Natural Stone, Installing tile and stone, Tile installation expertise | Tags: bathroom renovation, Glass tile, Installation expertise, Local tile expertise, Quality tile contractor, Questions to ask a tile installer, tile professionals | Permalink.